John Stanley Griffiths was born in Bombay, India on 30 October 1895. He was the son of Thomas Robert and Lily Griffiths of 32 Hilden Street, Haulgh, Bolton later at 30 Bromwich Street. The family had lived in India and Burma, as well as several places in Britain where Thomas was stationed. John was one of of ten children, three of whom had died by 1911. 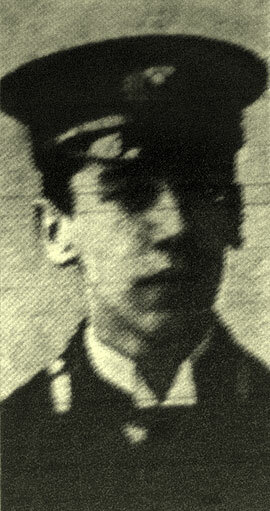 John had been a pupil at Sefton Park High School, Liverpool and attended Bolton Church Institute in Forms IIIA and IV from 4 May 1908 to 8 April 1909. He then transferred to Rivington Grammar School. He appears on the 1911 Census as 'Jack' rather than 'John'. John joined the Royal Navy Reserve in August 1914 as a Midshipman. He sailed to the Dardanelles in Turkey on HMS Prince George and transferred about 1 March to HMS Triumph. He participated in the Bombardment of Smyrna/Izmir by the British Fleet which lasted from 5 to the 9 March 1915. He died of wounds on 6 March 1915 and was presumably buried at sea. The Allies were keen to open an effective supply route to Russia through the Bosporus and the Black Sea: efforts on the Eastern Front relieved pressure on the Western Front. The British and French fleets were attempting to force the passage of the Dardanelles from 19 February 1915 by means of bombardments and landing parties of marines. Smyrna was the richest and most important port of Asia Minor and the principal railway junction in Asia Minor. The attempt to reduce the Smyrna forts by bombardment inflicted much damage but did not effect a landing. John's father and brother survived the First World War. John's youngest brother, Harold de Cray Griffiths, was killed in action during the Second World War when his aircraft was shot down off the coast of Denmark on 22 May 1944 while he was serving as a Sergeant Air Gunner with 57 Squadron RAF. News has been received at 30, Bromwich-st., the residence of Capt. T.R. Griffiths, of the 5th Battalion L.N.L., that Midshipman Jack Stanley Griffiths has died of wounds received during the bombardment of Smyrna by the British Fleet operating in the Aegean Sea. Griffiths, who was 19 years of age, joined the Royal Navy Reserve in August, and went out to the East on H.M.S. Prince George, being afterwards transferred to H.M.S. Triumph. He is the third son of Capt. Griffiths, the second son having joined the Royal Field Artillery and being now stationed at Lewes, whilst Capt. Griffiths is in France with the 5th L.N.L.